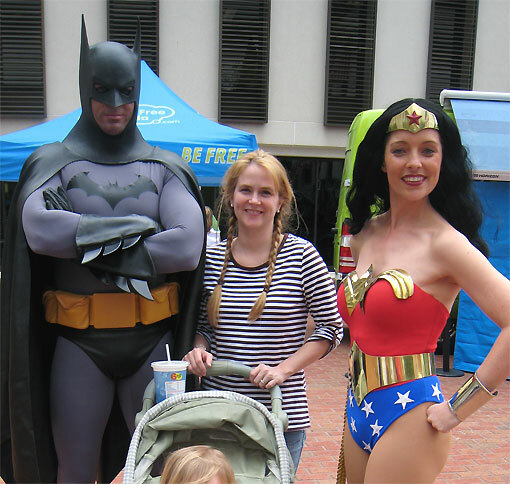 Here is a shot of my wife, the Irrepressible Gena, along with Batman and Wonder Woman. The picture was taken at the Florida Capitol building in March while they were celebrating Children’s week. They had tons of activities and games for the kids. My family was quite surprised to see Batman and Wonder Woman at the event giving out anti-smoking comics (last year’s FREE COMIC BOOK DAY issue of Justice League). According to Gena, the guy playing Batman was dead-on. He even used the gravely voice when talking with my daughter. Gena also mentioned that Wonder Woman was super nice! However, my wife was a little shocked that this Wonder Woman’s briefs revealed a lot more than Lynda Carter’s did (apparently the not-pictured backside was pretty skimpy). While my children enjoyed the event, I think my wife enjoyed meeting Batman even more. … I’m watching you, Bruce Wayne. Stay away from my girl! Sorry the kids aren’t in the picture. Gotta protect the innocent, y’know. Love this! Rachel had some photos of them, too, and “Batman” looked like he wasn’t messing around. Apparently? Don’t play innocent. You know you looked. Kind of ironic that they were handing out anti-smoking comics when Batman was probably talking like he had been smoking for 20 years with that gravely voice. Dead-on is right: I can even see a bit of an Adam West gut on the guy. Wonder Woman is hot. Did you get her number? Just in case, of course.